TOKYO -- Takeshi Uchiyamada, the enormously influential Toyota Motor Corp. executive who next month takes on the largely advisory role of vice chairman, drew inspiration from Japan's doomed push to build a jet fighter in the last days of World War II. The saga, as Uchiyamada told it in a speech to Toyota executives, kept him plugging away as lead engineer on the first-generation Prius, another project that was short on time, long on ambition and against heavy odds. It was early 1945, and designs for Japan's jet plane, based on Nazi Germany's Messerschmitt Me262, were on their way to Tokyo from Berlin when the submarine shuttling the plans was captured. The blueprints were lost. But Japan's determined engineers kept at it. With little more than photos of the German original, they cobbled together their own working jet from scratch. Never mind that the Nakajima Kikka flew only once -- just a week before Japan's surrender. The lesson, according to executives present at his speech: Think outside the box and never give up. "It was quite inspirational," one of them recalls. 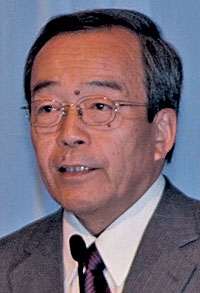 Uchiyamada has channeled that same never-say-die attitude during 43 years at Toyota during which he not only created the Prius hybrid franchise but also revamped the company's manufacturing and product-development processes during the financial, recall and natural disaster crises of the past four years. Soft-spoken and athletic, Uchiyamada, 65, was born in the castle town of Okazaki, not far from Toyota headquarters in Toyota City. He grew up dreaming about building cars, partly because his own father was a Toyota legend, having designed the Toyota Crown flagship sedan. Yet the younger Uchiyamada labored in relative obscurity testing vehicles for noise, vibration and harshness -- until he was tapped in 1994 to spearhead the Prius. His marching orders were deliberately vague: Build a car for the 21st century. When Uchiyamada reminded his bosses that he had never been a chief engineer before, they replied: "That's why you were selected." Hybrid drivetrains weren't even part of his brief. But when he showed his bosses plans for a car that got 50 percent better fuel economy than the best similar-sized car on the market, he was told that wasn't good enough. Make it twice as good as the best out there. What emerged was one of the carmaker's greatest thinkers -- nay, rethinkers. In true Toyota fashion, he made kaizen -- the principle of continuous reinvention and improvement -- an art. Rethinking things was a must if Uchiyamada were to score with the Prius. It had a radically new drivetrain, needed to appeal to the masses and had to come to market in near-record time. He commandeered nearly 1,000 people to work on the project and gambled with the car's futurist triangular silhouette. Then he took the biggest risk of all in deciding that a far-out gasoline-electric drivetrain might just work after all. Known internally as a computer geek, Uchiyamada's background in software programming was a key asset in troubleshooting the engine control unit that united the electric motor and engine. During development, Uchiyamada also pioneered the obeya, Japanese for "big room," concept of brainstorming that brings engineers into a large room and has them bouncing ideas off one another, says Jeffrey Liker, an engineering professor at the University of Michigan who has written six books about the Toyota Production System. "The obeya system has become a standard part of Toyota's product development system for all vehicles, a fundamental innovation in cross-functional collaboration now copied around the world," Liker says. More than a decade later, the name Prius is a byword for "hybrid car." The original hatchback is in its third generation and has spawned a hot-selling family of derivative models. The Prius is not just the best-selling hybrid in the world; in Japan it's the best-selling car, period. His new nickname stuck: "Mr. Prius." "Uchiyamada may have revolutionized the auto industry, starting the Prius line and making hybrids a natural part of the automotive landscape," Liker says. "He is a humble, quiet man who nonetheless refuses to compromise and views success as binary. Either you achieve the goal or you have lost." Uchiyamada's strength was a keen acumen for pinpointing customer trends and no-holds-barred will to examine every angle and never accept simple consensus compromises, says Jim Press, a former COO of Toyota Motor Sales U.S.A. Inc. and the first foreigner on the Japanese company's board of directors. "He always has elegant solutions that exceed expectations. He doesn't accept tradeoffs," Press said. "Every vehicle he touched reflected that genius. He made a tremendous contribution to building the Toyota brand and embodies the Toyota Way." Armed with newfound latitude, Uchiyamada continued to churn things up. As executive vice president in charge of global manufacturing, he oversaw Toyota's long-overdue overseas expansion. By 2008, he had transformed Japan's No. 1 automaker into the world's No. 1. A man known for shunning suits and ties in favor of sports coats and open collars gradually went corporate and donned the dark suits of the other top brass. And the challenges only grew once he arrived in the executive suite. For the past four years, with Toyota under the fledgling leadership of a greenhorn president, the company was buffeted by crisis after crisis: The global financial meltdown, an unprecedented recall imbroglio and then a year lost to Japan's devastating earthquake and massive flooding in Thailand. When he took the helm in 2009, President Akio Toyoda, the grandson of the company's founder, wisely kept Uchiyamada in his inner circle of top brass. And his decision to give Uchiyamada the global r&d portfolio was almost prescient. Within a year, Toyota's reputation for bulletproof quality and cutting-edge product development was being assailed by millions of recalls and concerns about unintended acceleration. The calm and deliberate Uchiyamada was an anchor in the storm. Once again, he reinvented the company's approach. His response to the recalls was sweeping and methodical. Among his changes: He reassigned 100 engineers to quality control. He extended the development cycle of new models by four weeks in an effort to root out glitches. He appointed more U.S. chief engineers. He created rapid-response teams of technicians to tackle problems in the field as soon as they occur. He also gave U.S. operations greater independence and strengthened communication among the labs in Toyota City and its far-flung engineering outposts. Steve St. Angelo, who oversees Toyota's North American manufacturing, says the engineers from Japan "went overboard to help us. If we needed them in the United States, they were on the plane immediately. They worked through holidays and were available 24/7. Uchiyamada-san gave us the resources we needed to improve our quality processes." After implementing his fix, Uchiyamada vowed, "A recall issue like what happened last year will never happen again at Toyota." Two years later, Toyota's sales and reputation have begun to recover. On the eve of his promotion to vice chairman, Uchiyamada leaves one more token of his leadership: the so-called Toyota New Global Architecture, an r&d strategy unveiled this year. Tailored to the changing times, it calls for basing millions of vehicles and multiple models on one platform, simultaneously developing multiple models with shared engineering teams and using common components across segments, not just nameplates. "It seeks simultaneous achievement of improved products and reduced cost," Uchiyamada said last month. "We will be able to decrease costs through commonization." Uchiyamada's job change, part of Toyota's annual management shuffle, takes effect June 15, pending approval at the company's general shareholders' meeting. Filling Uchiyamada's shoes as r&d czar will be Mitsuhisa Kato, a newly appointed executive vice president on the board. Kato, 59, joined Toyota in 1975 and recently helped lead customer service at Toyota's r&d group. Kato's acquaintance with Uchiyamada began in the 1980s, when Kato was chief engineer of the sixth- and seventh-generation Corollas and Uchiyamada was testing them for noise and vibration. "When he went to the Prius, I was really rooting him on," Kato recalls. "We collaborated to see if there were parts we could share between our cars. And we've worked together ever since." Uchiyamada, a father of three and yachting aficionado, still will have a hand on the tiller after June. Typically, Toyota executive vice presidents give up their posts to become presidents of affiliated suppliers in the Toyota Group. But Uchiyamada will remain on the automaker's board as vice chairman below Chairman Fujio Cho, a former Toyota president. Vice chairmen at Toyota, though often hidden from public, wield significant influence behind closed doors as advisers. His new position shows President Toyoda wanted to keep Uchiyamada available if needed. "He's not sailing off into the sunset," said Press. "Other companies can follow Toyota's playbook. But without players like Uchiyamada, they'll never catch them."